I am zone 6. 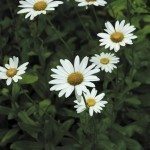 I have had a potted Shasta Daisy on my deck for 3 seasons. I leave it out all winter. Last year it bloomed beautifully. This year while it started off ok, stems growing and full, it is not blooming and the leaves are all now yellowing and droopy. It looks like it is dying. I am not doing anything differently. Any ideas? Yellow leaves can happen for a number of reasons, but in your case I am wondering when you fertilized last? I think they may be getting too much nitrogen. This can cause explosive growth at the beginning with few to no flowers and eventually causes the plants to yellow and start to die. If you have not fertilized, then underwatering, lack of nutrients or a fungus are to blame, likely. Increase water a bit, use a balanced fertilizer on the plant and treat it with a fungicide. This should take care of the most common causes of yellowing.